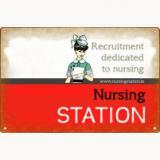 Nursing Station is an independently owned nursing staff recruitment consultancy. We consider ourselves to be a dedicated recruitment platform for nurses and for employers looking for qualified nurses to fill vacancies right throughout Ireland. Our main objective is to provide: experienced recruiters with deep knowledge of the nursing industry, the latest recruitment and HR advertising and data base technology , efficient & confidential handling of all nursing vacancy places - We will assist and supply you with all the necessary supporting services at each step of the nursing recruitment process. There will never be a fee to nurses/candidates for the use of our service, our clients (employers) cover all recruitment costs. Our aim is to both ensure candidates find a role that is most suited to them and our clients (employers) get the best fit for the job. If you are currently seeking employment in the Irish Nursing sector or simply have a question you may need to be clarified from our experienced recruiters, DON'T DELAY, EMAIL TODAY! Send any queries or your CV to hrsupport@nursing station.ie and a member of our team will be happy to get you on the road to employment.